This mod contains the 11 maps that will be played in HiddenCup2. It also contains 'HC2_Mappack' which is a map pack that randomly selects one of these 11 maps. The maps require WololoKingdoms and the lastest version of UserPatch. To get access to the maps, simply make sure 'HiddenCup2' is selected in your list of Visual and Content mods. A map known from the steam version of the game. Players start on a hill. The slopes of the hill are covered with rocky terrain, which makes it impossible to build anything on them. 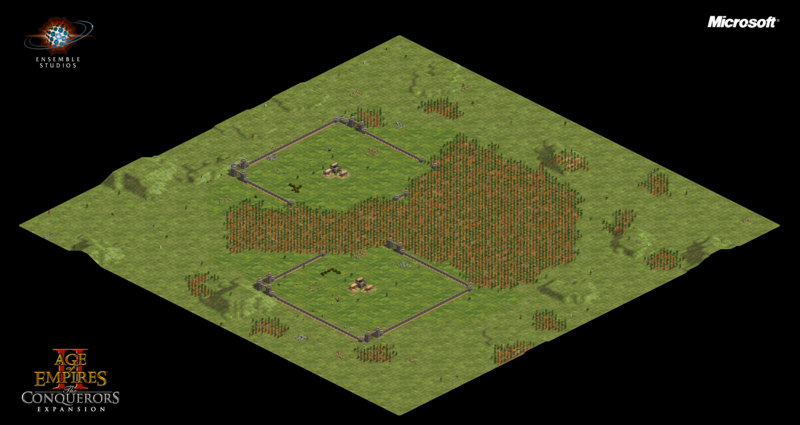 This makes it hard to wall defensively, and forces players to take the risk to chop wood in the lowlands, where the woodlines are larger. 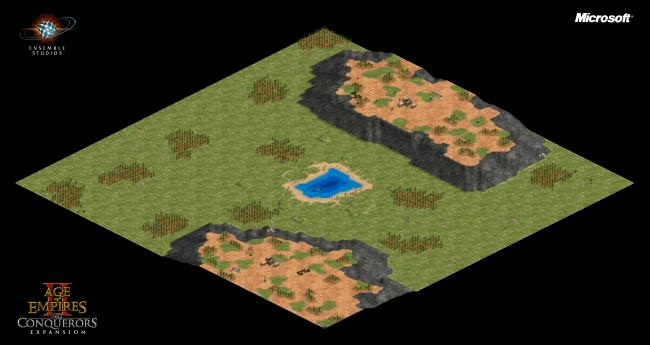 The lowlands additionally host a few wild animals, and in the center one can find a shallow pond. 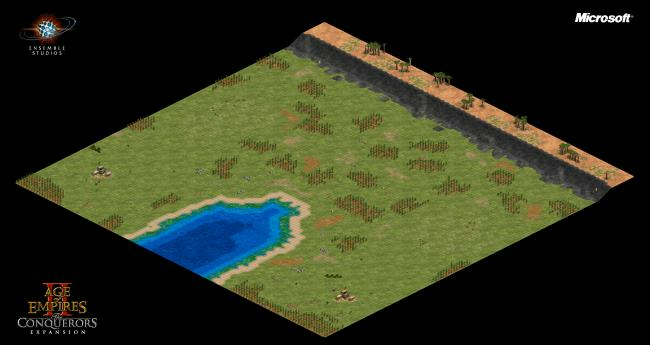 This version of Arabia had a few adjustments: Elevation was lowered, distance from the deer to the players base is more consistent, and the map gives a different start when regicide is selected: no more extra resources and villagers, but instead players start with a barracks, a king and 5 extra population space. 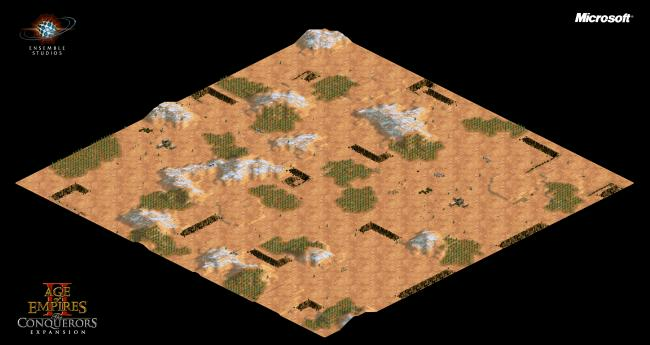 This new map was created by AlgernonR. 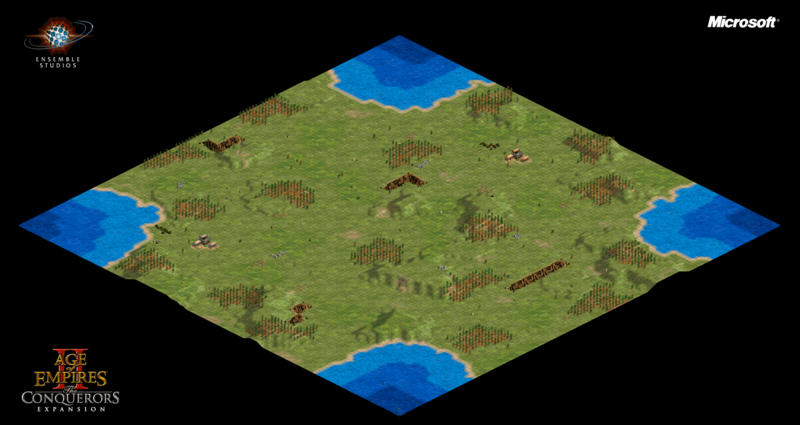 Players have many options to build their empire: they can choose to dock the waters, they can send villagers out to take deer, or they can hide in their starting corner. On the opposite side of the bay, there is a high mountain ridge with additional minerals and occasional trees. Four lakes in each corner give this map it's characteristic shape. Control over these lakes is very important since the large amount of fish can boost the economy significantly. This new map was created by HenkDeSuperNerd. Players spawn in fixed positions, close together. 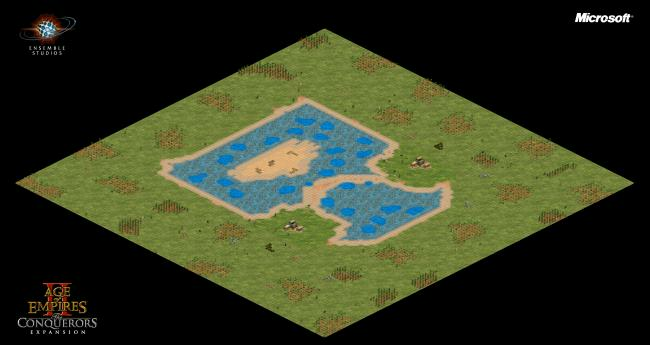 Their bases are separated by a swampy waterbody in the shape of a cup. Units can pass over and structures can be built on this mangrove shallow terrain. In the middle of the cup there is an island with additional gold piles, which proves to be an important objective for the late game. In this crazy map players rush to the middle to take control of the precious minerals. Their Town Center is built on beach terrain where miraculously giant fish jump out. This is a great source of food income for the early game, but after that initial boost players might struggle for resources, especially for gold and stone, which is all located in a region in the middle of the map, which is revealed to all players. 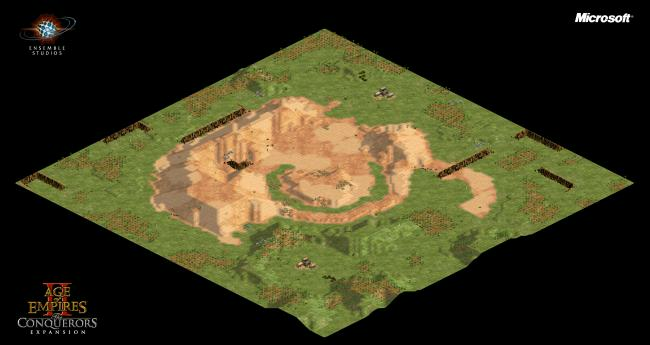 A classic map where players fight over control of a hill in the center of the map. Hungry wolves protect the many piles of gold on this hill. 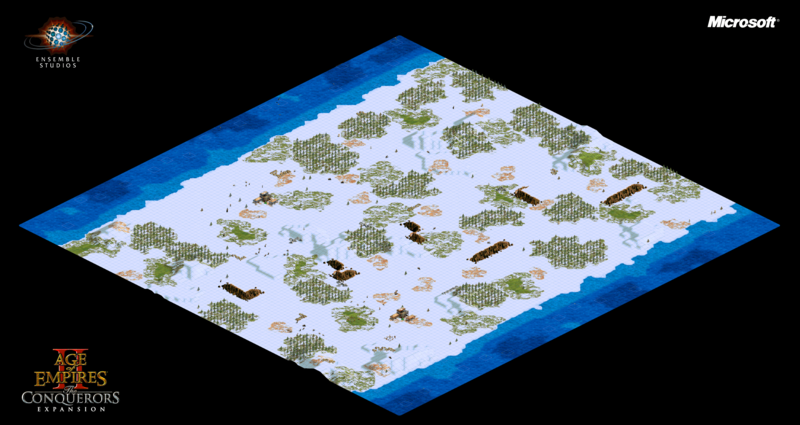 A map known from the steam version of the game. Players have their bases safely flanked by a forest, and additionally can benefit from starting walls. 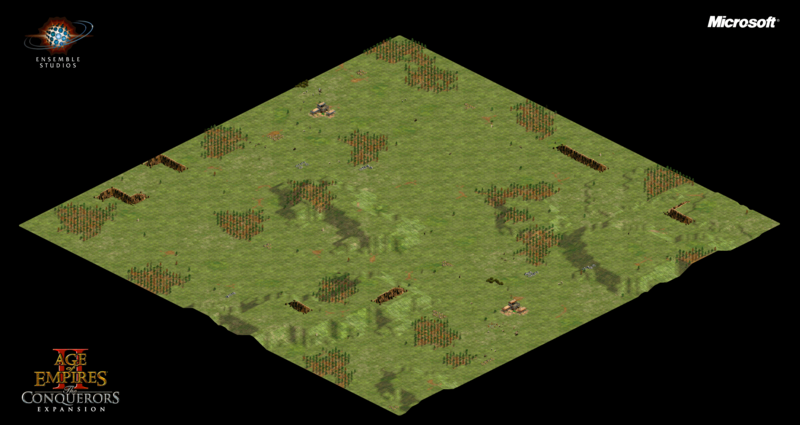 However, these palisade walls might not be as strong as you'd expect, and when an enemy suddenly cuts with onagers through the forest, you realize your bases wasn't as safe as initially thought. A classic map similar to Arabia, but with many cliffs. A map from the map pack LightRandom. Each Player starts on a large island almost completely surrounded by waters rich with fish. 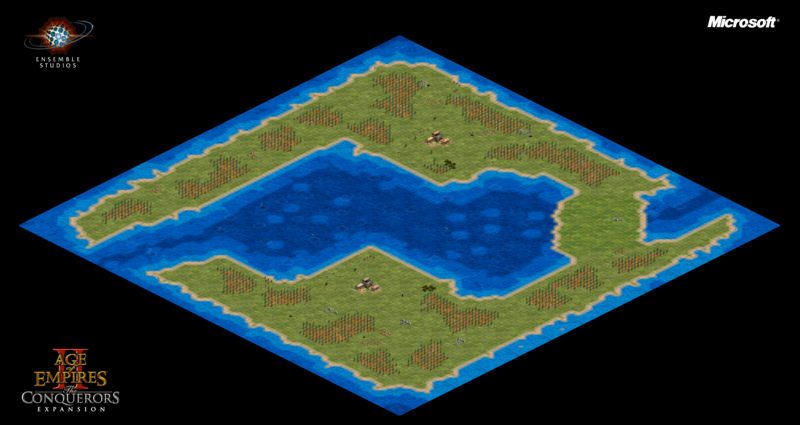 A land bridge connects the two lands which adds a possibility to attack on land, and which can hinder movement of ships over the map. Largely based on the original version of this map, the distribution of player resources might be different than what you're used to. A classic map which is elongated in one direction, two opposing flanks are covered by a strip of water. Plenty of fish live in the cold waters, and wildlife is abundant on the land, however forage bushes do not grow here. Randomly selects one of the above maps. Each map has an equal chance of being selected. When Arabia is selected, there is a 50% chance that that game will be played as regicide (where you need to protect a king) and 50% of being the default game mode.